2019 APS Expo & Banquet - The Antique Phonograph Society | The Antique Phonograph Society - Welcome to the worldwide home for people who love antique phonographs, gramophones and records! 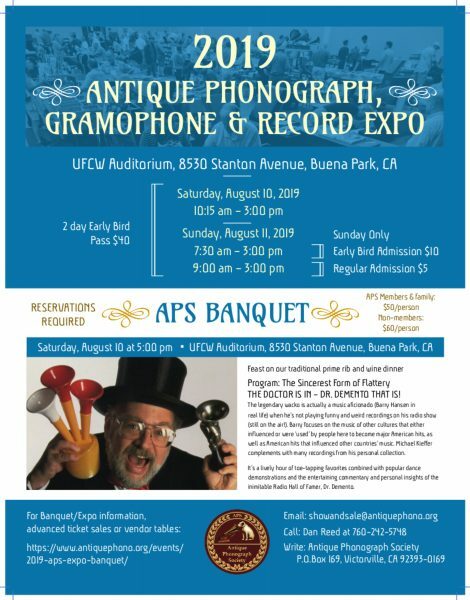 The Antique Phonograph Society Annual Banquet, Show & Sale will be held August 10-11, 2019 at the UFCW Union Hall, 8530 Stanton Ave, Buena Park, California. As always, expect dealers from all over North America to be offering a wide variety of items from the commonplace to the fabulously rare. Whether it be old recordings, phonographs, music boxes, or other antique mechanical music, the APS Annual Show & Sale is an excellent venue to find it. As in years past, the Banquet will include a presentation of interest to collectors and recorded sound historians. This year the Banquet will take place on Saturday, August 10. Everyone is welcome – – APS Members & Nonmembers! Sunday, August 11 – 9:00 A.M. to 3:00 P.M.
2019 APS Show Registration Form Click Here for the 2019 APS Show Registration Form. Occasional Seller’s Permit Click Here for the Occasional Seller’s Permit. Note: Some in-state vendors are required to have a seller’s permit. For those wishing to purchase Online via PayPal BANQUET and/or EARLY BUYER admission to the upcoming APS Show, please click the LINK following to make your payment. It’s IMPORTANT to use the “Note to Seller” area of the PayPal screen to tell us what is included with your payment; Early Buyers $40 per person, Banquet ($50 per person APS members & family, $60 per person non-members). Add $2 fee for PayPal reimbursement. Be sure to tell us your names so that badges and reservations are properly made.